Thanks to Drs. David Cohen, Herzliya Medical Center (Israel) and Vincent Graffeo, Marshall University, West Virginia (USA), for contributing these cases. To contribute a Case of the Week, follow the guidelines on our Case of the Week page. In a series of independent assessments , Epitomics antibodies to MSH6, Her2, CD99, CD20, CK8, and CK19 were rated as "optimally" staining. 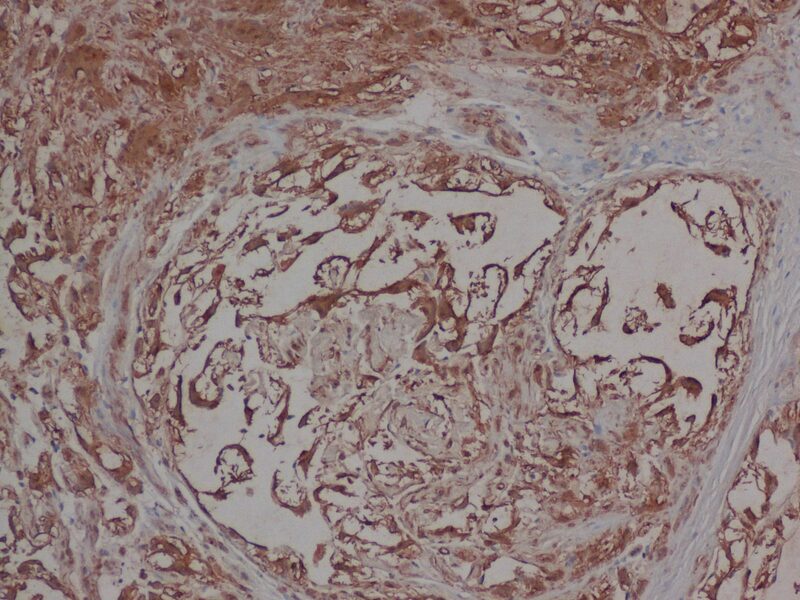 With our proprietary RabMAb technology, Epitomics continues to develop high quality antibodies and IHC kits for anatomical pathology use. See our full antibody listing and comparisons here . EP Clones™ are a line of high quality antibodies for anatomical pathology. 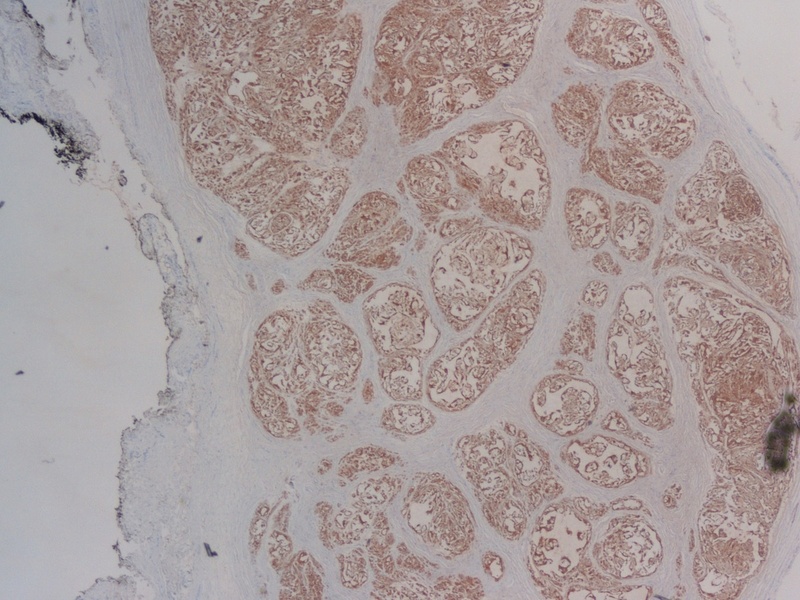 Each antibody was generated using Epitomics� patented Rabbit Monoclonal Antibody (RabMAb®) technology offering superior binding affinity and specificity. 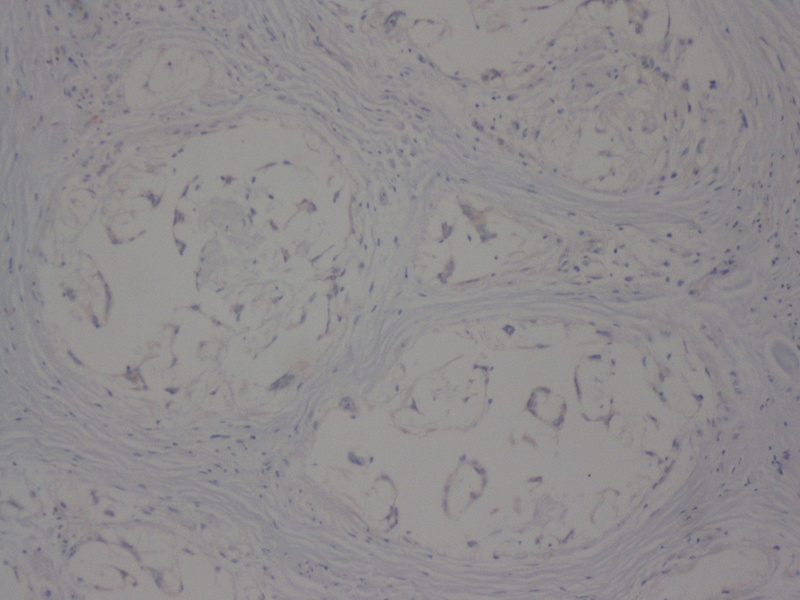 We now have over 150 antibodies, fully validated, ideal for FFPE tissues. 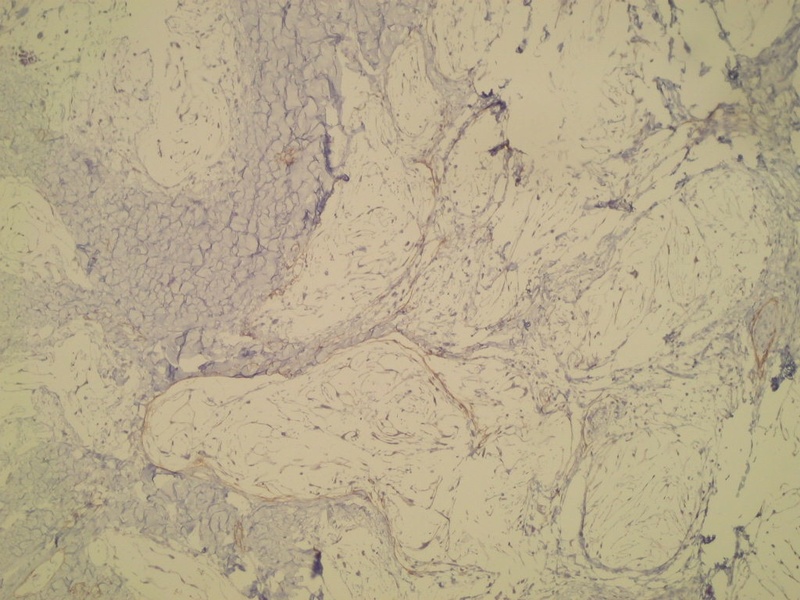 - Ampulla of Vater: Hanni Gulwani, M.D. 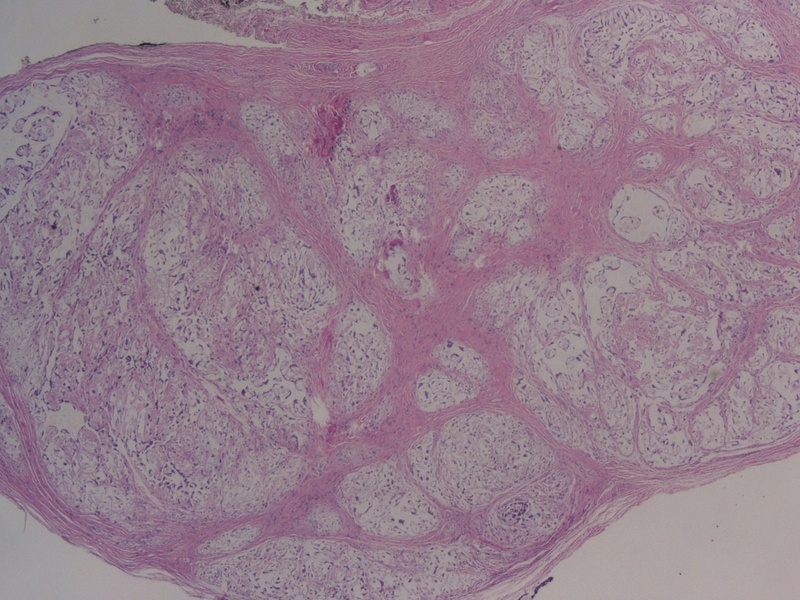 A 26 year old woman presented with a soft tissue tumor of her right thumb, which was excised, revealing a 2 cm nodular grey-white firm mass, covered by epithelium. 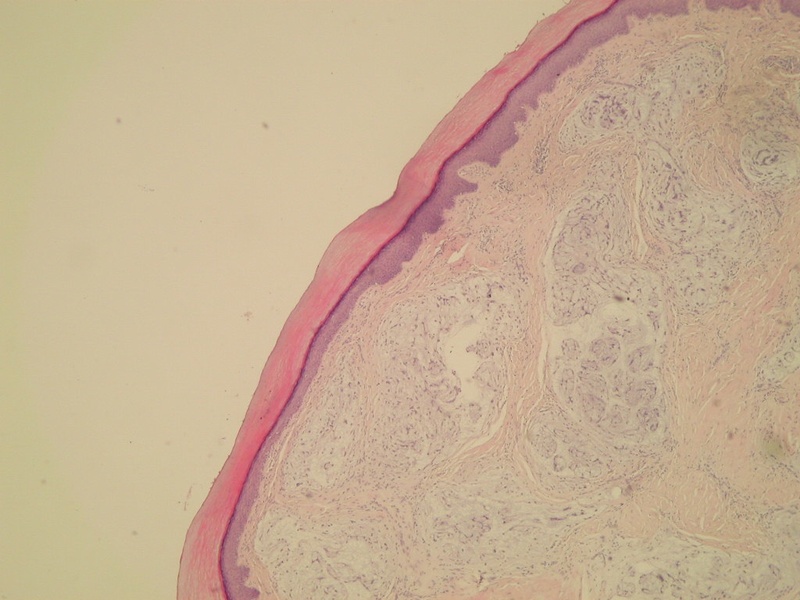 A 37 year old woman presented with a cyst on the right index finger, which was excised, revealing a 1.8 cm tan, solid nodule with a solid/slightly gelatinous cut surface. 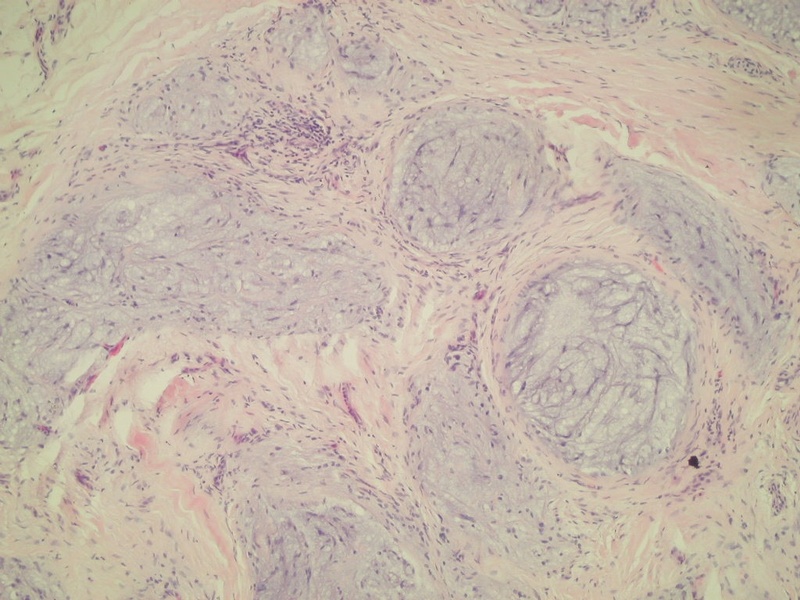 Nerve sheath myxomas are rare, distinct tumors of the peripheral nerve sheath, with a peak incidence in the 30's (Am J Surg Pathol 2005;29:1615). Patients present with solitary, superficial, multinodular, painless masses up to 2.5 cm, usually in the extremities. 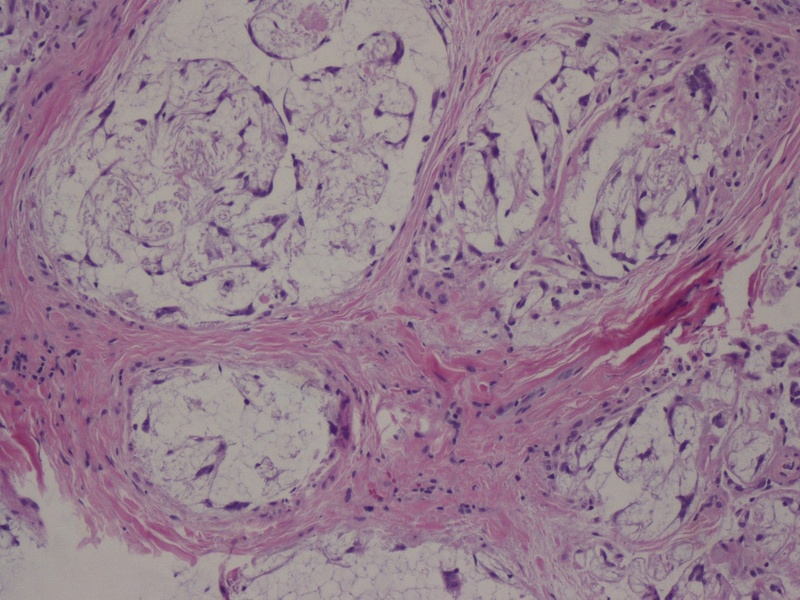 Tumors are typically slow growing, and often were present for years before being resected. 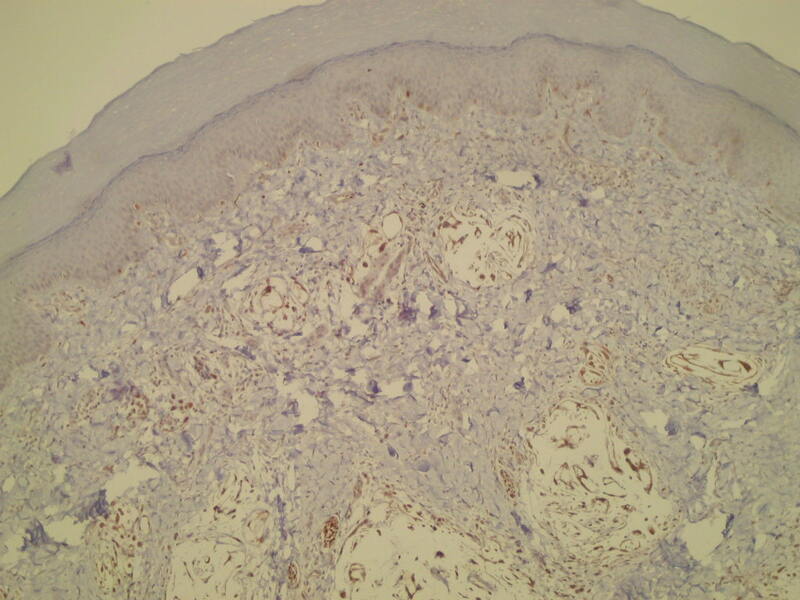 They typically involve the dermis or subcutis, forming multinodular, avascular masses with abundant myxoid matrix and a peripheral fibrous border. 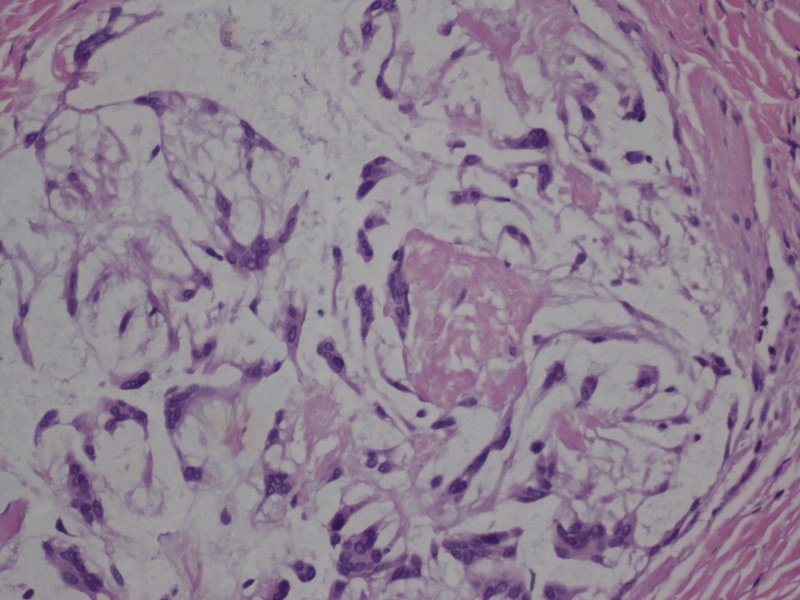 Epithelioid Schwann cells are present in corded, nested, or syncytial-like aggregates. 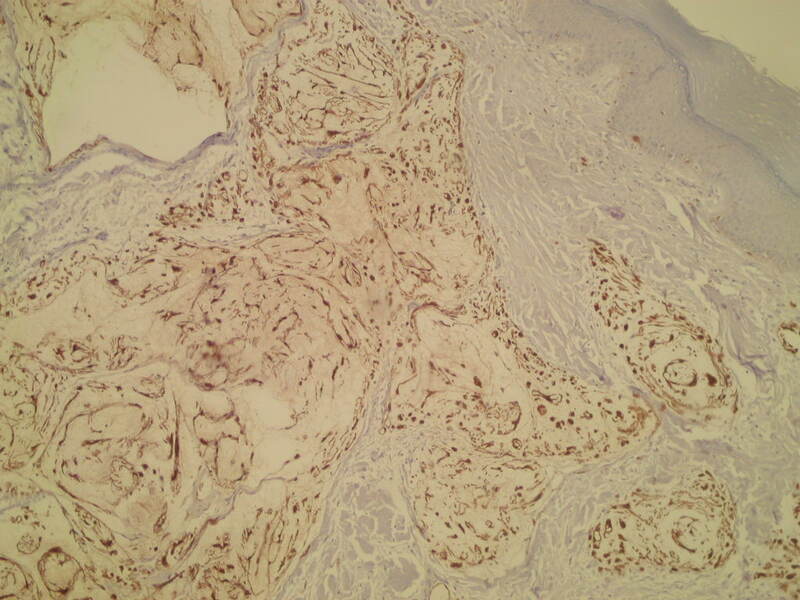 Stellate Schwann cells with cytoplasmic-nuclear invaginations are also present. The Schwann cells are strongly immunoreactive for S100 protein, GFAP, NSE and CD57. 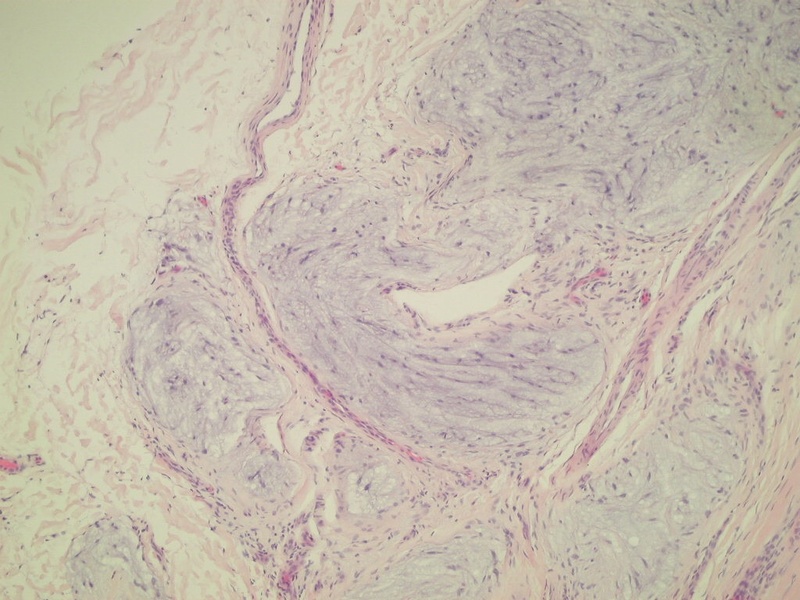 Occasional EMA+ perineurial cells are usually present, primarily in fibrous tissue. Ther are few/no mitotic figures. 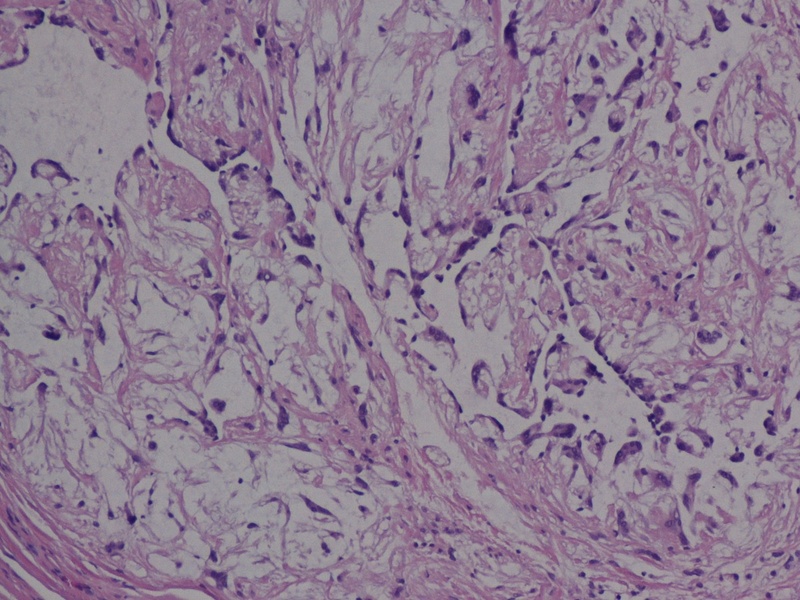 The differential diagnosis includes low grade myxofibrosarcoma, which typically occurs in the elderly, has MFH-like areas, curvilinear vessels (thick walled with a broad arc) with condensation of cells around the vessels, and often non-specific cytogenetic aberrations. 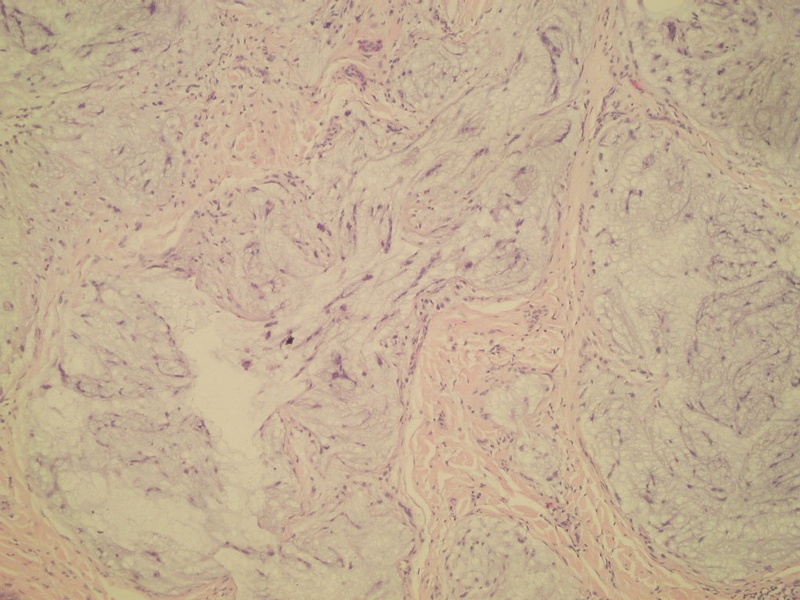 Neurothekeomas may have a myxoid stroma, but are distinct lesions by differential gene expression profiles and immunohistochemistry, and thought to be a variant of fibrous histiocytoma (Mod Pathol 2011;24:343). Complete excision is adequate treatment, and even cellular cases have an indolent behavior with complete excision. 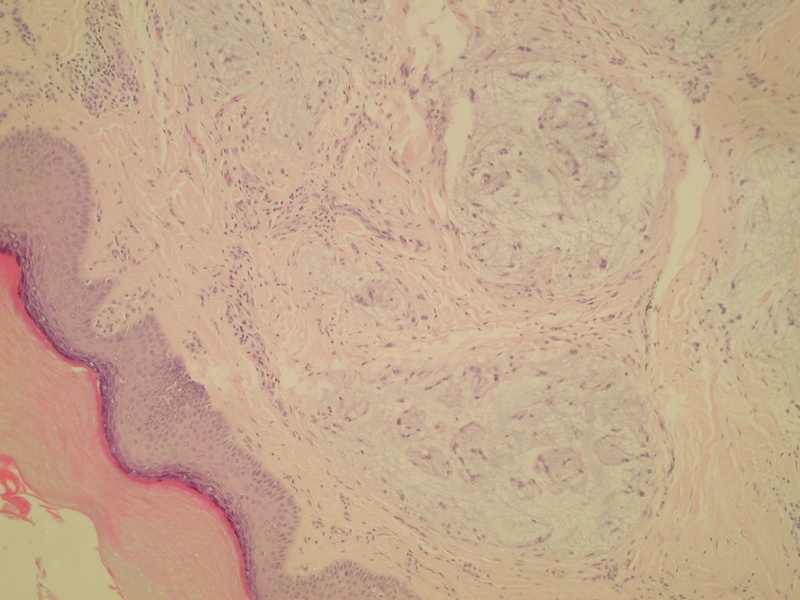 However, most nerve sheath myxomas are managed by simple excision, leading to positive margins and frequent local recurrence.